The HTC One (M8) for Windows offers better battery life than its Android counterpart—at least, according to HTC’s own specifications. HTC’s One (M8) is available running either a recent version of the Android OS, or, as of this week, Microsoft’s Windows Phone. HTC officials have said the hardware between the two is virtually identical, with the same chassis, screen, microprocessor, memory, and storage built into both phones. HTC, however, says the Android version of the phone is rated at 20 hours of 3G talk time, and up to 496 hours of standby time, as noted by Neowin.net. HTC’s One (M8) for Windows is rated at 22 hours of 3G talk time, and up to 528 hours of standby while using 3G. That’s a 10 percent advantage for the Windows Phone version in talk time, and a 6.45 percent advantage in standby time. 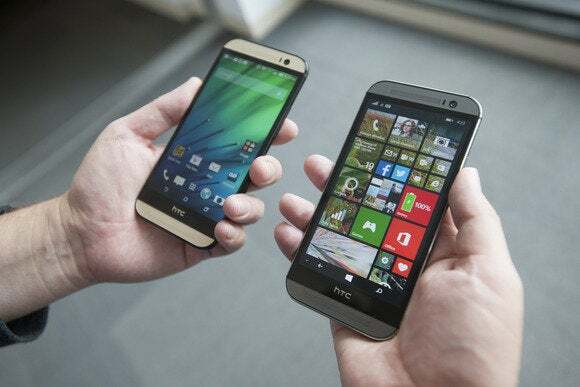 The natural question is whether Microsoft’s Windows Phone OS is more efficient, from a power perspective, than the Android version 4.4.2 (KitKat) that is powering HTC’s phone. If so, that might be a selling point for consumers hoping to eke out every last bit of power from their HTC One (M8) phone—and a feather in the cap of Microsoft, which has just 2.5 percent of the world smartphone share, compared with almost 85 percent for Android. Under the hood, though, there may be another answer: The two versions of the One (M8) may not be truly identical, after all. Consider the cellular radios the two phones use. HTC’s One (M8) for Android supports a number of different frequencies: 850/900/1800/1900 MHz for 2G GSM/GPRS/EDGE networks; 3G WCDMA 850/900/1900/2100 MHz with HSPA+ for Europe, Asia, and the major U.S. carriers; the CDMA frequencies used by Sprint and Verizon; and the 700/800/850/900/1800/1900/2100/2600 MHz LTE frequencies. The One (M8) for Windows uses the same 2G, 3G, and CDMA bands, but only a subset of the LTE frequencies that the Android version uses: specifically the 700/1700/1800/2600 MHz frequency bands. We asked HTC to explain the differences between the two, and the company has yet to respond. But what we’ve found seems to indicate that the two versions of the HTC One M8 differ in terms of the power used. We're also currently running our own battery tests to see if we can prove what HTC itself claims. 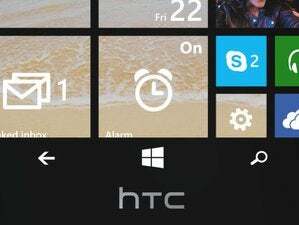 For now, however, if battery life of your next phone makes a difference, consider buying the HTC One (M8) for Windows.